tractor steering control T-40 is needed to maintain the straightness of the movement, as well as to change the direction of motion by rotating the front guide wheels. 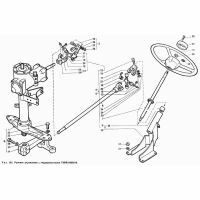 The steering apparatus includes a steering column, steering with a plow, a steering wheel and its shaft, and the cardan joint. In order to facilitate controls on the T-40 steering equip Hur. In operation, need time to check the steering condition and monitor reliability rezbovannyh compounds of the general state of parts of the steering column, and after 960 hours of operation -. Exercise lubrication of all parts subject to friction.